Larson Andrew Welsh grew up in Henderson and graduated from Green Valley High School. Larson then attended Utah State University, graduating in 2007. He graduated from the UNLV Boyd School of Law in 2011. Larson focuses his current practice on civil litigation and creditor’s rights, which includes landlord/tenant law, consumer collection and collecting judgments. Larson has a broad range of civil litigation experience. 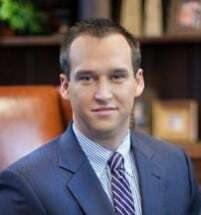 Larson has actively litigated cases in the following areas of law: Title VII (employment discrimination); the Fair Labor Standards Act (FLSA); the Federal Mine Safety and Health Act of 1977; Fair Debt Collection Practices Act; Fair Credit Reporting Act; and the Magnuson-Moss Warranty Act. Larson has also represented clients before various Nevada Administrative Agencies, including the Nevada Labor Commissioner and the Department of Employment, Training and Rehabilitation. Outside the office, Larson enjoys the outdoors, basketball, playing piano and spending time with family.